And now that all the clothes are clean, I've come to realize that my two oldest children have serious dresser issues. Their "hand-me-down, get by for now" dressers have four small drawers and a cupboard with doors down below. The stuff down below is a massive wad of turtlenecks, bathing suits, wool sweaters and tank tops. Seriously, when I clean their room, I take my foot, shove all the stuff back in the bottom cupboard, slam the door and walk away. So today, we took a trip to IKEA and bought some nice, cheap cloth baskets and got those little dressers all neat and organized. Then Emma had the genius idea to make little pictures on the outside of each drawer/door so they would know what to put inside. The taped-on method is a little wonky, but otherwise I love it. I did Mary's sketches, Emma did her own. Emily, I was going to call you on the way to IKEA but I knew you'd just finished entertaining/holiday, so I wanted you to relax and not feel the need to rush out and meet us. But we're on for next week. I met with my new book group last night. (They really wanted to "make" the blog today. Hi girls.) We spent about five minutes talking about the book and rest of the time telling funny stories and laughing so hard, I left with sore abs and achy face muscles. I just wrote a new post on baby center about getting a chore system in place for the girls. One woman can't be expected to do it all. And I think the magnetic refrigerator grid pad that Joan, from BusyBody Book sent me is going to be just the thing for this. Thank you, Joan. 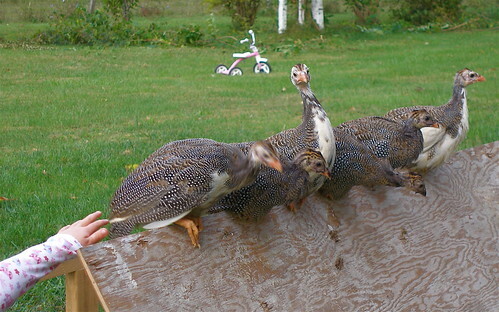 The guineas have had their own little Independence Day. They are now free to move about the cabin…or yard. And word to the wise, don't forget you left the guineas out after dark. We left them out in the dark for maybe thirty minutes. Bye-bye one poor little guinea. Emma reminds me, "Mom. Life on the farm can be tough." And Mary keeps telling me, "When the guinea's ready, he'll come back." She goes out to the back yard every day and calls to him. Meanwhile, our six hens have become five hens plus one rooster. Mary and Elizabeth have runny noses. Could cold season already be here? What do you do to protect your children from the flu during this season? The girls have been wanting pancakes for breakfast for the last few days. And because I'm not at my culinary peak come morning, I decided to make the pancakes this afternoon. We made a few with cinnamon and chocolate chips "for special", and some plains for Dan, bagged them and tossed them in the fridge for tomorrow morning. Hello? Why haven't I been doing this before?? Thanks for banging through the random thoughts with me. Oh, so the laundry fairy was at YOUR house today. I sat and I sat here eating bonbons and waiting for her to show up and put away my clothes. But she was previously engaged at your house. Maybe she’ll be here tomorrow. The clothes being done just blows me away… I don’t know if I will ever see that happy day! Oh I am jealous, ALL the laundry done?!?! That is a red letter day for sure!I always make a lot of pancakes (or french toast or waffles) at a time, enough to last for the week. They freeze really well and then you can just toast them up later. SO nice!As for cold and flu season…I just hope and pray! Oh, that and lots of hand washing and sanitizing. Hopefully your girls are just having some allergies not colds! Sorry that you lost a guinea already and that the girls are sick. Yeah for laughing til you hurt though, and finished laundry! And for pancakes already made and waiting for morning. That’s how I do it here and it is much nicer than making them with demanding hungry kids. You go girl!You win the best mom award today! whenever i make pancakes, i always double or triple the batch and then freeze them. it only takes a few seconds in the microwave & some syrup to make them tasty. All the washing!! Congratulations – this is my dream! Yeah – we made the blog! The laughing was the best workout! i aspire to that state of laundry. and i am know to kick many a drawers shut, too. maybe the girls have seasonal allergies? mine are slight but are acting up big time right now. kate gets it too. she takes one claritin before bed every night for about 2 weeks and that dries her up and prevents the sinus infection she inevitably gets if we don’t do that. night is key – allergies are at their peak in the a.m. so if you take the 24hr. dose then, it doesn’t help as much. 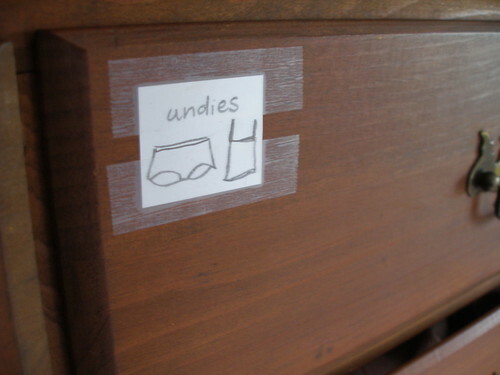 the labeled drawers are cute. we need to do that too. Whenever we make pancakes on the weekend we freeze the extras for during the week. Katie doesn’t like pancakes but Tristan could eat them 24/7. We just heat them for about 30 seconds in the microwave. Freeze them spread out on a cookie sheet or something though so they don’t all stick together in the freezer bag. Oh, no. I’m guessing that guinea isn’t coming back. And that a raccoon or fox or something is feeling mighty full. A daily vitamin, handwashing after we’ve been out and about, and (this is the advice of MY childhood pediatrician, God rest his soul) a bath every day with a glug of cider vinegar in the water. Not enough to make the kid smell like a pickle, but enough to kill germies. I freeze pancakes and waffles all the time! I also make up sausage wraps and breakfast burritos and freeze those too. I am so impressed with the laundry! Do you and the girls hire out cause I could sure use your help in teaching a 15 year old boy!! I love those tiny fingers in the pic with the hens. Alright, you’ve inspired me… today (and probably tomorrow) needs to be laundry day. Congrats on the laundry! I wish you many days of energy and organizing moods, those days are the best. We too, finally let our hens out in the big, green world only to lose one. It puts a bruise in your heart. But it’s so darn cute to see them hyper and running about. I think there’s an Ikea buzz. That sounds like my kind of book club! very good random thoughts. i’m totally stealing your pancake idea. i’ll get back to you on the cold/flu stuff. somewhere around here i have some good ideas but they are not coming to mind at this moment. i love random thoughts. 1. do you have a waffle maker? because that was my solution to the pancakes in the morning problem. (but i love the fridge idea too.) 2. rats about ikea. rats, rats. need to get back there too. (turns out i need 2 more plates, which i know now after having people for dinner.) and 3. have you tried any homeopathic remedies for the colds? 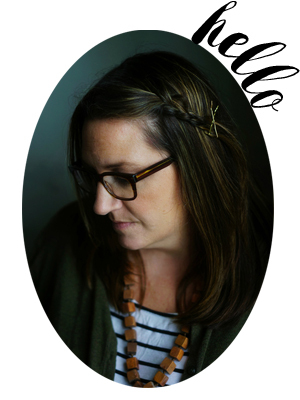 ask grace – she’ll know what to take! (or i can tell you what we take, but i’m not an expert by any stretch.) love random thoughts. xo. Yay, I love the update and all the fun farm things happening.When I make pancakes I usually make a ton and then keep them in the fridge or even in the freezer. Mary requests pancakes almost everyday so I had to figure something out!